Each of these buildings has claimed the title of, ‘World’s Tallest Building’ at some point in history. I. The Great Pyramid of Giza was completed in about MMDL BCE. 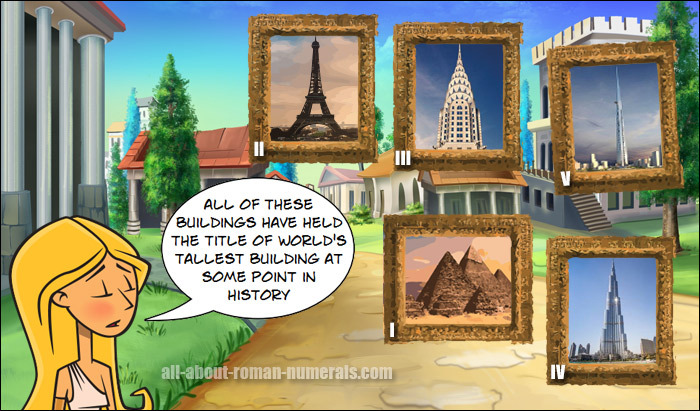 It is almost L stories high and was the highest building in the Roman World. Originally the structure was CXLVI metres CDLXXX feet tall but with erosion it is now about VIII meters or XXV feet shorter. This magnificent construction remained the tallest building on Earth for MMMDCCC years. II. The Eiffel Tower was completed in MDCCCLXXXIX. It stands CCCXXIV meters or MLXIII feet tall. It is about the same height as an LXXXI story high building. III. The Chrysler Building became the world’s tallest building title on May XXVII in MCMXXX at CCCIX metres or MCLVII feet tall but only held the title for XI months. It was surpassed in height by the Empire State Building the following year. IV. Burj Khalifa is tallest structure built by humans. It was opened on January IV, MMX. It stands LCCCXXVIII meters or MMLCCXVII feet tall. – Interesting facts about some of the Current Tallest Buildings in the world.